← A UPP ainda existe? [UPDATE] The UPP command in these favelas changed in the last week of February. According to the press relations office of the Pacification Police Office, “The current commander of the Chapéu Mangueira UPP, Captain Sérgio Stoll, will leave to begin the Officers’ Advanced Training Course, a necessary part of the military police career. In his absence, lieutenant [Rodrigo] Veillard will take command of the unit, under the supervision of Major Felipe Magalhães, former commander of the unit,”– but the change must certainly have something to do with the subject of this blog post. While the police work to control the situation in several UPP favelas, a French reporter got permission from druglords who migrated out of pacified areas to an unnamed location in greater Rio, and got their daily activities on film. The excellent program, which includes a response about this phenomenon from State Public Safety Secretary José Mariano Beltrame, is at this link, and in English. And here is a recent Veja magazine article about the “beachhead” status of the UPP in Complexo do Alemão. A new Veja interview with Secretary Beltrame, who speaks about the situation in the favelas behind Leme, is here— and Veja has another bit this week, on the new UPP intelligence unit. That’s what a resident of one of the favelas behind the South Zone neighborhood of Leme told RioRealblog, after witnessing what he called an “invasion” by members of the Comando Vermelho gang, in the early hours of January 20. Police say residents are exaggerating events, because they’re so afraid things will go back to the way they were. There is sporadic violence in pacified favelas, which brings on investigations, searches and other police action, depending on the situation. Rio de Janeiro’s fourth UPP went to the Babilônia and Chapéu Mangueira favelas in June 2009. Since then, they’ve been considered a model of pacification, attracting VIP visitors such as New York mayor Michael Bloomberg, during the UN Rio +20 conference; and actor Harrison Ford with his family, just days ago. In 2012, the Bar do David, located in Chapéu Mangueira and famous for its seafood feijoada, was the first favela boteco, or tavern, to win Rio’s annual Comida de Buteco contest. Babilônia is also an example of what can be done in terms of eco tourism e reforestation, once pacifiation opens up a territory in the city, making it accessible to everyone. And the urban upgrading program Morar Carioca focused on the area early, in 2009, with improvements in drainage, sewage collection, water supply, reforestation, public lighting, mudslide prevention and the creation of leisure areas. Except that, according to this report and interviews with residents, violence is returning to the favelas and in a sense to Leme itself, where real estate prices increased a great deal due to the arrival of a police pacification unit in the neighborhood. This is no isolated case. According to sources cited in the O Globo newspaper, pacification in the North Zone’s Morro da Mangueira still hasn’t taken hold. 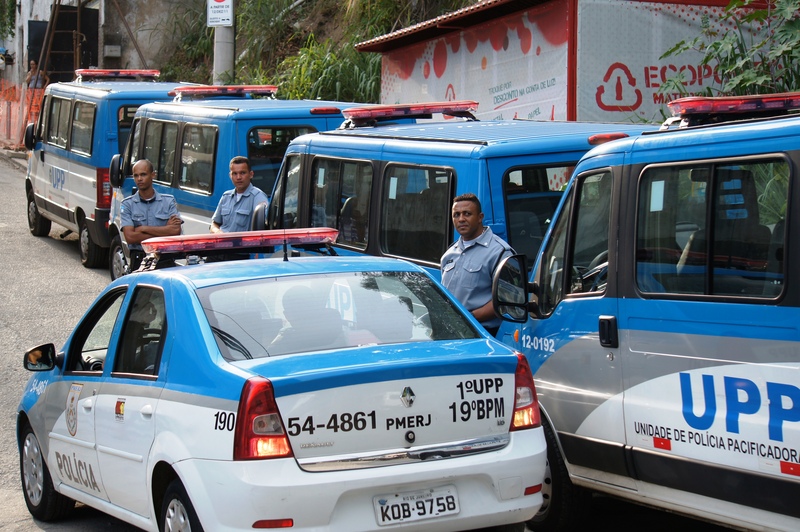 Another problematic UPP is responsible for the Coroa, Fallet and Fogueteiro favelas, where a corruption scheme that came to light in 2011 is still being investigated. Allegedly, criminals from the Amigos Dos Amigos gang stayed in Chapéu Mangueira after pacification, foregoing visible weapons. This isn’t news. Drug trafficking continues all over the city, as is the case in just about any metropolis. Pacification aims not to end trafficking, but to retake territories and reduce violence. This source walked a friend from that spot down to the asphalt, as cariocas call the formal city, passing the area where the UPP police are usually posted, in front of the FAETEC community court on the Ary Barroso path up the hill. But no police were there. Since that night, residents say they haven’t slept in peace. “There was a curfew for residents last Friday, Feb. 22, and Sunday, Feb. 24, there was shooting at 7 and 9 p.m., respectively,” says one. “The night no longer belongs to residents,” comments another. According to them, the new competition between gangs has led to an arms race. Since the end of January, it’s not unusual to see AK47 rifles, pistols and machine guns in the arms of drug traffickers. “The Comando Vermelho invades one day. The next, it’s ADA’s turn,” says one of the residents. According to a well-informed source who wishes to remain anonymous, such nighttime battles are no more than some shots fired from the top of the Chapéu Mangueira hill. To find out what happened on the hilltop, the 12th district police station, in Copacabana, has begun an inquest. Today, military police and dogs searched the vegetation in the area for weapons and drugs, but found nothing. The problem in Babilônia/Chapéu Mangueira arises at a tough moment in Rio’s transformation, a time of achievements and challenges. The alliance between the city and the state governments isn’t as steady as it was five years ago, when both Eduardo Paes and Sérgio Cabral were in their first terms and the city was just starting to turn itself around. Now, Paes is going full steam ahead on his mega-event preparations. Residents and activists who oppose relocations and demolitions— speak out, but he’s already re-elected. Those who keep a critical eye on city hall are increasingly concerned over a lack of transparency, dialogue, and participation. Cabral, responsible for pacification, is becoming a lame duck as Rio closes in on the 2014 gubernatorial election. The alliance between his PMDB and the PT at the federal level is showing cracks, since each party has its own candidate for his succession. Meanwhile, the Metro moves forward, same for the port revitalization, Rio runs out of water because the electric company cut power to the water company though the electric company blames the water company, forced internment of crack addicts has begun, ferry and metro fares go up, the state government prepares to privatize the Maracanã soccer stadium, the first of a slew of new museums is set to open, the Providência cable car system, too, Eike Batista gets to do what he wants with the Gloria Marina, Guanabara Bay is apparently becoming even more polluted, a new Pope’s on his way (together with millions of young pilgrims), and the city council, ah the city council… actually cut their own incomes. And, at the center of all these changes, good or bad, sits the pacification policy, now with thirty units and moving into the Complexo da Maré. At this point, the UPPs have to work. At least that’s what the terrified residents of Chapéu Mangueira and Babilônia think. See O Globo‘s coverage, here. This entry was posted in Brazil, Transformation of Rio de Janeiro / Transformação do Rio de Janeiro and tagged Eduardo Paes, Morro da Babilônia, Morro do Chapéu Mangueira, pacification Rio de Janeiro, Rio de Janeiro gubernatorial race 2014, Sérgio Cabral, shooting Chapéu Mangueira, shooting Leme, UPP, UPP Chapéu Mangueira/Babilônia. Bookmark the permalink. 1 Response to Is the pacification unit still there?